XPoint is an active anatomical support with combined tech- nology capable of reducing the pressure points of the body. The MultyPoint technology is based on a combined system of multiple independent elements and three-dimensional springs that respond separately to the different pressures of the body. Each MultyPoint element has the job of supporting the weight of the body when resting. It follows the movements, reducing the pressure points to a minimum and maintaining the natural curve of the vertebral column. 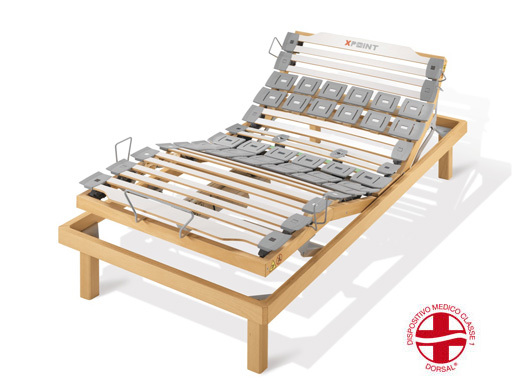 Slats in ecological 7-layer beech featuring great strength and protection from humidity. The multilayered beech wood does not contain polluting resins nor chlorine. Accurate controls are conducted to guarantee the right degree of humidity, stability, resistance and flexibility. the XPoint cursors have two adjustment levels: sideways movement of the cursor and an additional (+/-) adjustment, which allows personalising the firmness (harder or softer) of the back-lumbar zone. Even the lordosis zone can be adjusted at three different heights to adapt perfectly to your body. 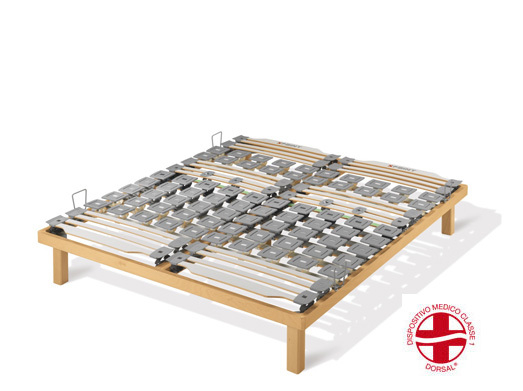 The suspensions that support the 3D MultyPoints and the new slats have different levels of firmness in relation to zones with greater or lesser loads, making XPoint a seven-zone system. The three dimensional springs are made of Hytrel®, a material with an elastic memory, that guarantees greater flexibility and longer duration. The new XPoint corners – an evolution of the “finger joint” – is made completely of beech wood. The new design gives aesthetic purity, high quality finishing nevertheless using solid materials. The new XPoint corner has been patented by Dorsal®. 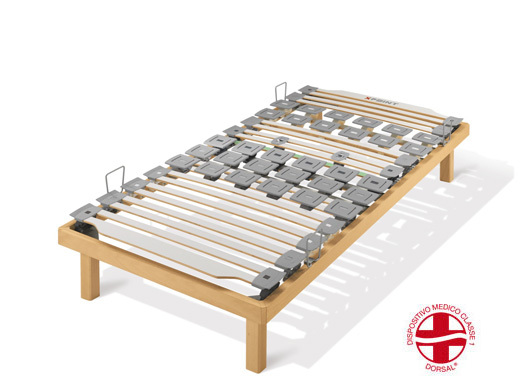 XPoint 400, XPoint 300 and XPoint 200 slatted frames are available in the standard RA adjustable single bed with two motors, NA single bed and FA queen and king bed. 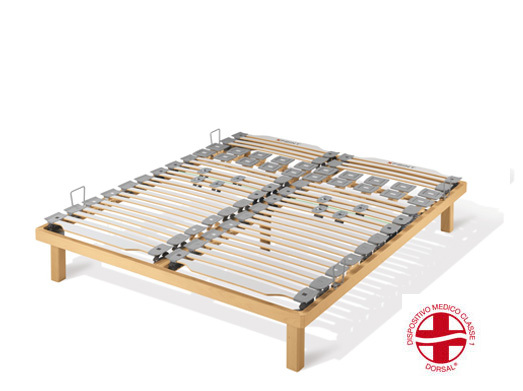 This traditional range has the addition of the innovative R4 adjustable single bed with four motors. XPoint R4 provides greater adjustment of the headrest and footrest by using separate actuators which allow to achieve any wanted position: reading a book, watching TV, working with your laptop, enjoying breakfast, relaxing your legs – without the need for piles of pillows. XPoint R4 can store up to four personalised positions. XPoint R4 is equipped with two courtesy lights: one is a flashlight located in the remote control, the other is integrated in the motor for discretely lighting the floor to guide you out of the bed. XPoint uses a radiofrequency (RF) remote control that can function at a range of up to 15-20 metres. It comes with an Energy Stop device that prevents the presence of electromagnetic fields inside the bed (stopping the power to the socket). In case of a blackout, it uses two 9v batteries that allow the headrest and footrest to lower back to sleeping position. In stand-by mode, it consumes less than 0,1 W, which is absolutely in line with the most recent requirements on ener- gy waste (Community Directive 2005/32/CE, European Regulation 1275/2008 and following integrations introduced by the Community Directive 2009/125/CE). XPoint 400 consists of MultyPoint three-dimensional elements which are distributed to support the physiological characteristics of the vertebral spine. The MultyPoint three-dimensional elements have different firmness grades to accommodate shoulders, pelvis, legs and calves areas. 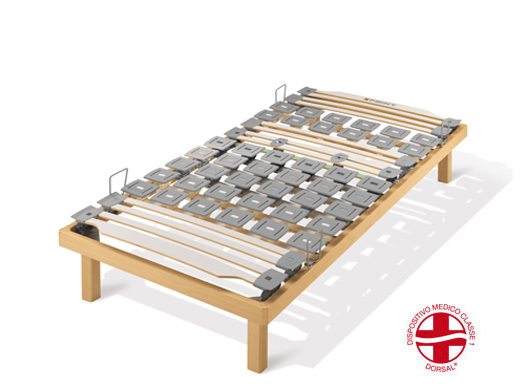 This combined technology, working in perfect synergy with the mattress, allows muscles to relax completely, reducing night-time postural changes, and ensuring a comfortable rest and sleep. The device for adjusting the height (three different levels are available) and firmness of the lordosis zone allows personalising XPoint 400 for a perfect anatomical adaptation. Multiply beech wood frame 60x30mm. Multi Point system with comfortably soft springs for the calf zone. Moderate support suspensions for the feet. The MultyPoint three-dimensional elements accommodate the shoulders, pelvis and legs. The new Dorsal slats are used to support the head, calves and feet areas. The combination of the two technologies offers a unique sensation of wellbeing and relaxation. 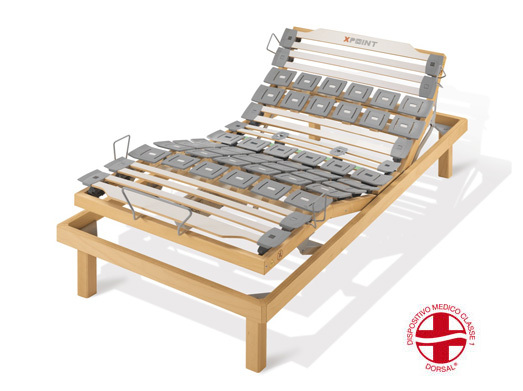 The adjustment device with three different heights and two firmness levels in the lordosis zone allows personalising XPoint 300 to adapt perfectly to your body. Moderate support to accommodate the head. Multi Point system for a soft cosy shoulder zone. Lower back area comprising two twin slats and several shores for graduated support. Three height regulations and sliders/tensioners for two types of rmness. Multi Point system with reinforced support springs for the hip zone. Multi Point system with moderate support for the thigh zone. Comfortably soft suspensions for the calf zone. Moderate support suspensions for the feet. The MultyPoint three-dimensional elements are placed on for the shoulders whilst the new Dorsal slats cover the head, pelvis, legs, calves and feet areas. The choice of excellent materials allows the anatomic support to follow the mattress entirely, also because the slats are less bent making XPoint 200 particularly suitable for side sleepers, while offering a balanced support to the pelvis area. The adjustment device with three different heights and two firmness levels, in the lordosis and hip zones, allows personalising the XPoint 200 to adapt perfectly to your body. Moderate support to accommodate the head. Multi Point system for a soft cosy shoulder zone. Lower back area comprising two twin slats and several shores for graduated support. Three height regulations and sliders/tensioners for two types of rmness. Reinforced support suspensions for the hip zone and sliders/tensioners for two types of rmness. Moderate support suspensions for the thigh zone. Comfortably soft suspensions for the calf zone.. Moderate support suspensions for the feet.